Join Martha as she teaches the classic sauces everyone should know how to make: hollandaise, béchamel, beurre blanc and marinara. Each of these easy, adaptable recipes offers a culinary lesson in flavor-building techniques, so viewers can learn to create other sauces in the same family. 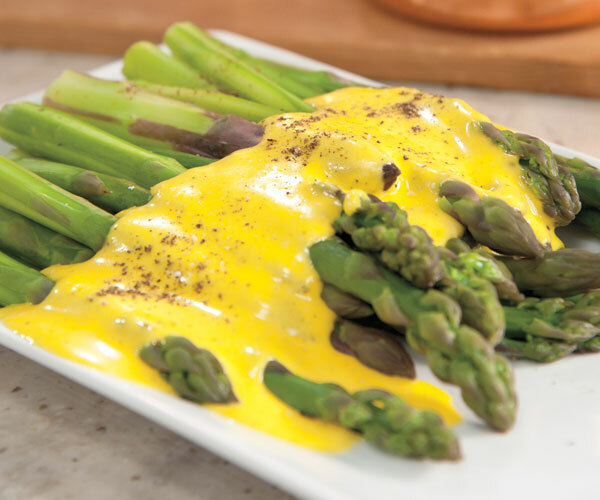 Martha begins with two different methods for preparing hollandaise sauce, a delicious accompaniment to steamed asparagus and eggs Benedict. A creamy béchamel sauce becomes the basis for a grown-up take on macaroni and cheese. Martha serves the French sauce beurre blanc over steamed lobsters. Finally, she prepares a quick, fresh-tasting, better-than-anything-from-a-jar marinara sauce using only four ingredients. Martha Stewart discusses how to keep hollandaise sauce from separating. The key to creamy, crowd-pleasing mac and cheese is Mornay sauce – a variation on basic béchamel. Martha Stewart makes this macaroni and cheese recipe on the "Sauces" episode of "Martha Stewart's Cooking School." Bring a large pot of water to a boil, then add pasta; salt generously and cook pasta to manufacturer’s instructions. Transfer to a colander, rinse under cold running water, and drain well. Melt butter in a 4-quart pot over medium heat. Whisk in flour and cook, stirring with a wooden spoon, until bubbling but not browning, about 45 seconds. Add milk and whisk to combine. Bring to a simmer, stirring with a wooden spoon (scrape across the bottom and around edge of pot to prevent scorching), until thickened and smooth. Reduce heat to a simmer and cook for 20 minutes. Add fontina, Gruyere, Cheddar, and Parmigiano-Reggiano cheeses, stirring until completely melted and sauce is smooth. Season with salt and black pepper, add cayenne and nutmeg, and stir to combine. Add pasta to sauce along with white pepper and salt; stir to thoroughly combine. Serve immediately. This macaroni and cheese recipe appears in the "Sauces" episode of "Martha Stewart's Cooking School." Visit the episode guide to watch a preview and get a cooking tip.